Gig Harbor’s luxury and waterfront real estate is a convenient location for travelers and close proximity to Tacoma has fostered steady local growth in recent years. The city’s historic downtown area in particular has seen an influx of commercial development to complement its many charming decades-old buildings and landmarks. 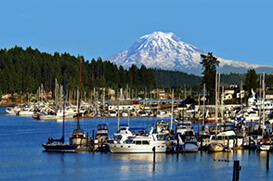 Residential growth has occurred throughout the Gig Harbor real estate area in recent decades, and produced several attractive new home communities. Gig Harbor home listings feature a wide variety of late century west coast designs, and some of Washington’s most environmentally friendly construction methods. The finest Gig Harbor homes sell for upwards of $2 million, and are in very high demand with luxury buyers throughout Pierce County.